I could marry an anchovy. I LOVE THEM! I like radishes, but we we’re not talking nuptials… until now. I was searching for antipasto ideas for my Chocabaret success party and I came across a recipe for cold radishes in an anchovy and garlic paste. It sounded good, but I forgot to buy the radishes and I ran out of time. When I was racking my brain, two days later, for tapas ideas, the radishes popped up. BUT, I thought how much better it would be to roast the radishes. Roasting softens the flavor and makes them sweeter which would contrast well with the saltiness of the anchovies. Radishes can be hot and I’m not talking “trendy”. Common pinky-red European radishes are often spicy, almost peppery when raw. Anchovies and garlic are not shy of flavor either. 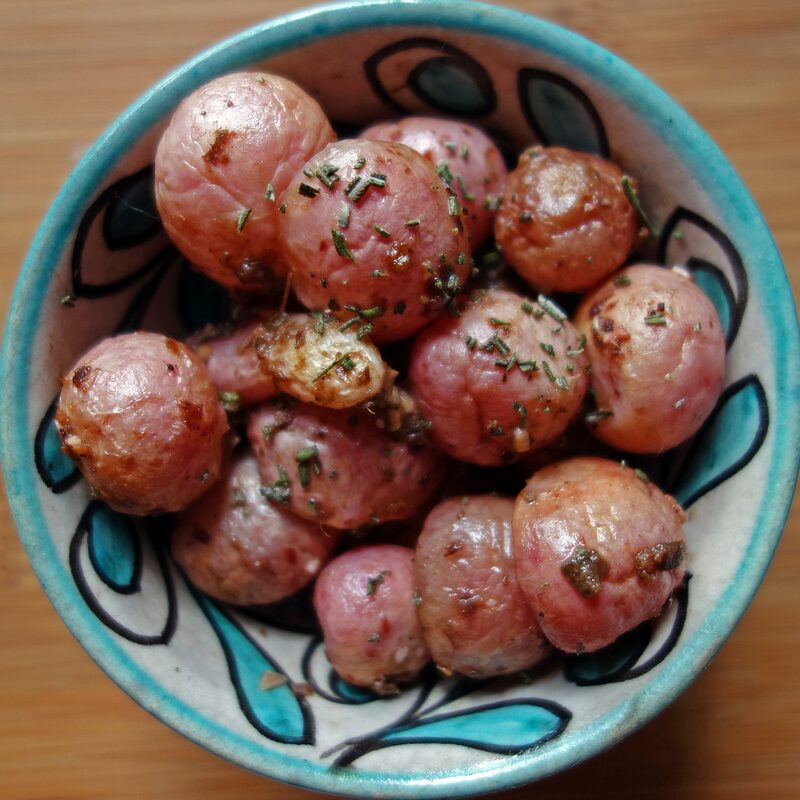 Roasting them together tames them into a dish where they seem to give up their feisty notes and make nice together in the sand box of your mouth. Did I really just write that? Forgive me. They just remind me of bratty, little, only-children who are impossible until they meet each other in the playground and have to be nice… at least to one another. Toss radishes with olive oil, anchovies and garlic. Season with salt and pepper. Lay radishes, cut side down on sheet pan and roast for ten minutes or until they are tender. Toss with rosemary, lemon juice and drizzle of good extra-virgin olive oil and serve.